Politics may stop at the water’s edge, but that’s where geopolitics begins. Last year saw high drama over the South China Sea. This year, it’s the Indian Ocean that is emerging as the new theatre of power struggle, and Beijing will look to arrest the drift in ties there as it welcomes Sri Lankan President Maithripala Sirisena today. Ever since Sirisena came to power defeating Mahinda Rajapaksa in January’s presidential elections, Beijing has had to deal with a series of setbacks as Chinese-backed projects have come under scrutiny for their links to corruption-tainted Rajapaksa. A US$1.4 billion reclamation project, in particular, has been put on hold, driving a wedge between China and Sri Lanka. China has warned of consequences for future investments and relations have looked to worsen. Yet for China, Sri Lanka has never been more important. With its man in Colombo out of the picture, Beijing is under pressure to move quickly to find new ways to engage a country where its strategic interests remain just as vital, yet its diplomatic clout is on the slide at a time when competing powers are circling. Being equidistant from East Asia, the Middle East and Africa, Sri Lanka is an important component of Xi Jinping’s “New Silk Road” strategy of increasing China’s economic ties with neighbours to the west and southeast. “China is becoming increasingly dependent on energy flows and trade through the Indian Ocean region, which has become crucial to our energy security. Last year China imported more than 300 million tonnes of crude, 80 per cent of which came from the Gulf region,” said Hu Shisheng, a South Asia expert at the China Institutes of Contemporary International Relations. Currently much of China’s oil imports from the Middle East follow a circuitous route through the Strait of Malacca to China’s eastern seaboard, the country’s industrial hub. 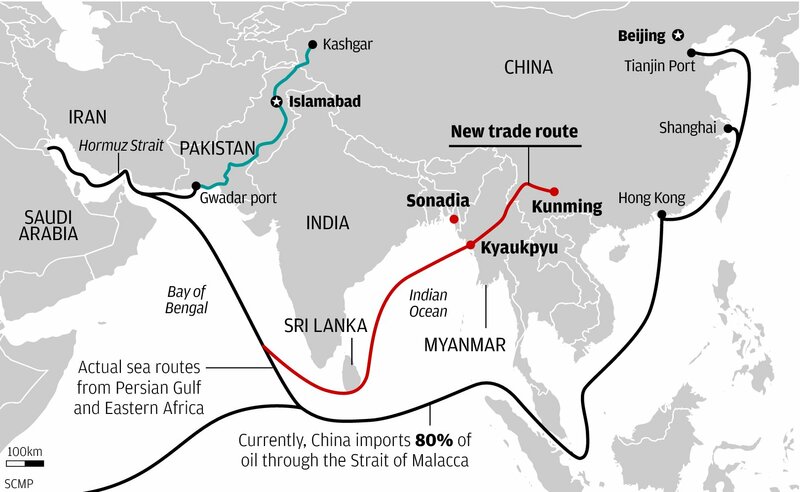 If factories are to be located in the western provinces such as Yunnan, they would need shorter and more economical oil routes through the Indian Ocean that obviate the need for the Malacca chokepoint. Sri Lanka’s location makes it an important transit hub for such routes. Some of these supply lines have already begun to open up. Last month Myanmar opened a new pipeline that will slash shipping time for African and Middle Eastern crude oil to China by more than a third. The 771 km pipeline is to transfer 22 million tonnes of crude a year directly from the Kyaukpyu port on the Bay of Bengal to Yunnan, without requiring tankers to take the familiar long route through the troublesome South China Sea. China has also been looking to develop a port at Sonadia in Bangladesh for the same reason. In Pakistan, it has similarly been trying to develop a 2,000km economic corridor connecting the deepwater port of Gwadar on the Arabian Sea with Xinjiang. “China will want to diversify its energy routes as well as protect them. It has in the past imported oil from the Gulf but did not participate in war games and drills. We left it to the US to secure its passage. We can’t take a free ride anymore,” said Hu. But China’s increasing activity in Indian Ocean is putting it on a collision course with India and the US, alarmed at its growing engagement with countries like Sri Lanka and its forays into the waters it used to leave alone. “Asia-Pacific, especially western Pacific, is too crowded. The Indian Ocean is more conducive for China to gain military modernisation and develop naval capacity. China has participated in counter-piracy drills since 2008, so a more visible presence in the Indian Ocean would be good for Chinese navy,” said Hu. That’s just the kind of talk that makes India jumpy, loath as it is to any hint of naval manoeuvre in the Indian Ocean region. New Delhi’s political and military establishment has deep institutional memories of US President Richard Nixon’s mobilisation of the Seventh Fleet to the Bay of Bengal in support of Pakistan at the height of the 1971 India-Pakistan war over the liberation of Bangladesh. It was the appearance of a Russian nuclear-armed flotilla, prompted into service at India’s request, which prevented the US fleet’s advance on that occasion, but the memory still rankles. In recent years, New Delhi has firmly resisted suggestions of US military bases in Bangladesh, Maldives and Sri Lanka, just as it has been alarmed by China’s power projection in the area. The docking of two submarines last year at a Colombo terminal built by Chinese companies is said to have been the last straw in India’s relations with Rajapaksa. In a recent interview to the South China Morning Post, the former president blamed India’s spy agency RAW for conspiring to bring him down. “I asked the Indians, ‘Why are you doing this? … I assured them that I would never allow the Sri Lankan soil to be used against any friendly country, but they had other ideas,” Rajapaksa said. In the run-up to January’s presidential elections, Sri Lanka expelled RAW’s Colombo station chief for galvanising support against Rajapaksa, Reuters had reported at the time citing unnamed sources. With Rajapaksa not around and the new government making it clear that its foreign policy will not be China-centric, Beijing will now have to formulate a different strategy to pursue its Indian Ocean objectives, especially with the US looking to reclaim its place in the equation. Washington has been pressing for an international inquiry into allegations that Sri Lankan forces mowed down thousands of civilians in the last leg of Rajapaksa’s war against Tamil militants in 2009. Rajapaksa refused to co-operate either with a full international inquiry or to launch a domestic probe, prompting the US to distance itself from Sri Lanka. China filled that void with money and clout. Soon after the coalition led by Sirisena won the election, the United Nations agreed to delay the release of a long-awaited report on the alleged atrocities to give the new government time to come good on its promise of a domestic inquiry. Rajapaksa’s departure and Washington’s indication that it will go easy on the new government vis-à-vis human rights have now created a window for the US to engage Sri Lanka again. Within days of the election results, a Wall Street Journal opinion piece co-authored by former US deputy secretary of state Richard Armitage urged Washington to give Sri Lanka a higher billing. “Sri Lankans now have a choice with whom to engage, and China needn’t be their only friend. The US should move quickly to take advantage of the opening presented by the newly elected government,” it said, calling for greater US investment in infrastructure projects and contacts with the military. Armitage is only channelling a Senate Foreign Relations Committee report in December 2009 co-authored by current Secretary of State John Kerry. Then a senator, Kerry’s report urged the US government to forge closer ties with Sri Lanka to prevent it from drifting into the “Chinese orbit”. “US policymakers have tended to underestimate Sri Lanka’s geostrategic importance for American interests … Sri Lanka is strategically located … directly in the middle of the ‘Old World,’ where an estimated half of the world’s container ships transit the Indian Ocean,” it said. Apart from fresh diplomatic overtures and the UN breather, there are signs Washington is working to fix that lapse. “The US Navy recently released a new maritime strategy document with the ‘Indo-Asia-Pacific’ as the first region discussed in a section entitled ‘Forward Presence and Partnership’,” said Nilanthi Samaranayake, a strategic analyst at US-based research organisation CNA Corp.
That could be one reason why Chinese experts of late have also been talking about an “Indo-Pacific” corridor of economic partnership as a counter to America’s Asia pivot, which is centred on the western Pacific. “We need a China-India-plus policy. Plus, as in Southeast Asia, Sri Lanka and other countries. This is the right time to start a China-India maritime dialogue,” said Hu. Beyond the emerging tussle over the Indian Ocean, what makes China’s job of re-engaging Sri Lanka all the more challenging is the ideological tilt of domestic parties. The island’s two main parties are the centre-right United National Party (UNP) and the centre-left Sri Lanka Freedom Party (SLFP). UNP, led by current Prime Minister Ranil Wickremasinghe, has historically been inclined to the West. “UNP leader and former president J.R. Jayawardene’s pro-America tilt precipitated Sri Lanka’s rift with India over the Tamil issue in the 1980s. On the other hand, SLFP has traditionally been more in alignment with south-south sentiments,” said political analyst Kusal Perera. SLFP, which is yet to split officially, has many of its leaders, including Sirisena, in the new coalition while others have chosen to stay with Rajapaksa. “With the UNP and a chunk of the SLFP in the same government, there will be push and pull over the foreign policy orientation and no one knows which way it will tilt, if at all,” said Perera. Hu has no such doubts. “Any government in Colombo will want China’s help. China has the capacity to help Sri Lanka make full use of its geographical advantage. No matter who comes to power, they will want to make friends with China,” he said.